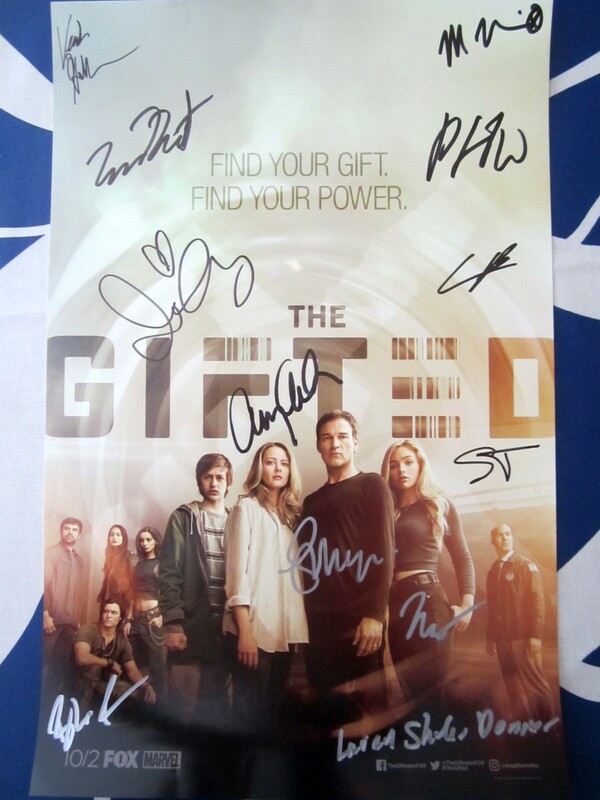 Gifted 2017 San Diego Comic-Con 11 by 17 inch poster autographed in black or silver marker by Matt Nix (writer), Derek Hoffman (executive producer), Jeph Loeb (Marvel's Head of Television) plus stars Amy Acker (Kate Strucker), Stephen Moyer (Reed Strucker), Sean Teale (Eclipse/Marcos Diaz), Jamie Chung (Blink/Clarice Fong), Coby Bell (Jace Turner), Emma Dumont (Polaris/Lorna Dane), Blair Redford (Thunderbird/John Proud Star), Natalie Alyn Lind (Lauren Strucker) and Percy Hynes-White (Andy Strucker) for a total of 12 signatures. Obtained at very limited 2017 San Diego Comic-Con signing, with certificate of authenticity from AutographsForSale.com. ONLY 2 LEFT.